After almost two years of searching, they’ve finally located and recovered the black box of Air France Flight 447. This is the flight that crashed in the Atlantic, killing all on board. 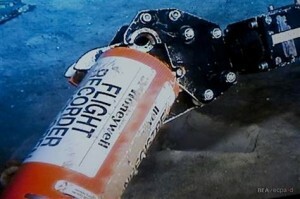 You can read the full story at Investigators find Air France black box. There is going to be a lot of interest in this story as it develops. I gave my opinion in the article What happened to Air France Flight 447. The find comes one month shy to the day of the two year anniversary of the accident. Interestingly enough, it also comes one day before another open-water airline accident – the ditching of ALM Flight 980 on May 2, 1970. The Air France black box was found in over 12,000 feet of water. The ALM 980 black boxes have never been recovered, though I know where they are within a mile or two. They’re on the sea floor under 5,000 feet of water. So as we remember the passengers and crew of Air France Flight 447, let’s also remember the 23 people who lost their lives on ALM 980 and the 22 people who are still missing. You can read more about the tragic flight of ALM Flight 980 at 35milesfromshore.com. The karma between Air France Flight 447 and ALM Flight 980 continues. The voice recorder was recovered on May 2, which happens to be the 41rst anniversary of the ALM 980 ditching. Maybe we’ll finally found out exactly what happened aboard Flight 447.